Regular readers will most likely know a handful of factoids about us WANF-ers and our proclivities, among them: one of us is English, the other Italian-American; we enjoy making a wide variety of dishes, many of which we’ve sampled on our travels; and we have a young child. The more perspicacious among you will notice one or more incompatibilities in the above, especially with regard to the child and love of travel. Upon our recent visit with our English family, these came home to roost and were amplified by an exquisitely-timed bout of gastrointestinal trauma. 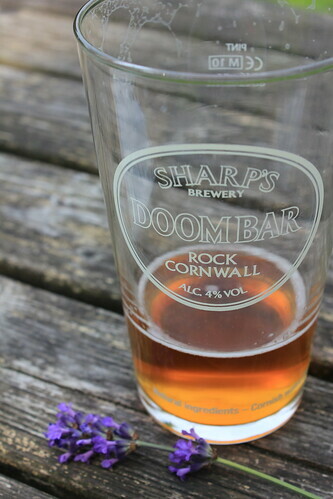 Not that this made for a disastrous visit – far from it, in fact – but it certainly hampered our ability to sample local specialties and, after having looked forward to the prospect of an honest pub lunch for around 18 months, it made such sampling as we were able to undertake an exercise in sweet frustration. Perhaps ironically for someone from such a small country, my knowledge of its regions is slight. I blame this on the bourgeois attitudes of my parents as much as on two back-to-back dreadful, cold, wet and windy family vacations to Wales at the age of five and six which persuaded us to forsake the British Isles henceforth for the balmier climes of continental Europe. However, I credit these early trips to Europe with my passion for good food, having been introduced to Breton buckwheat gallettes stuffed with local wild asparagus and grey shrimp in cream sauce when, through the owner of the gite and local parish priest, Monsieur Fleury, we acquired a pile of them, freshly prepared by the gnarled mitts of one of his flock, an ancient black-garbed widow named Madame LaPorte. That I was immediately and completely terrified by the sight of this one-toothed old crone lest she put me in her cauldron yet volunteered to visit her again the next evening to collect some more (my first halting words of French having been “encore des gallettes, s’il vous plait!) speaks volumes about the transformative effect of good food. So it was that when we joined my family – sister, her husband and kids, plus my Dad and my step-mother – in an old sandstone farmhouse in the Cotswolds this past week, my expectations for what would ensue were mixed at best, chiefly featuring chaos of screaming children chasing chickens interspersed with light showers worsening to daylong downpours and limited access to anything worth eating. I am pleased to report that I was simultaneously almost completely right and completely wrong. Where we stayed, in the tiny hamlet of Hampen, one would have found it almost impossible to go hungry especially at this time of the year when nature is in a riot of growth provoked by 18 hours of daylight and regular gentle showers, and still-warm organic eggs, with yolks so rich they were almost red, showed up on our doorstep every morning. It was, therefore, a major disappointment when, laid low by a virulent stomach bug acquired somehow on the plane over, I was forced to do just that to avoid regurgitating these delicious vittles. 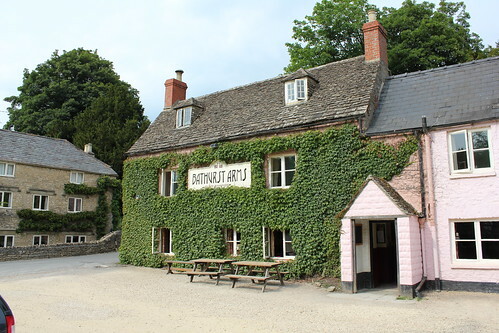 Happily, in spite of my weakened condition, the spirit of those long ago days in Brittany prevailed and consecutive lunchtime visits to two of the Cotswolds’ finest pubs were enjoyed, if approached rather warily. 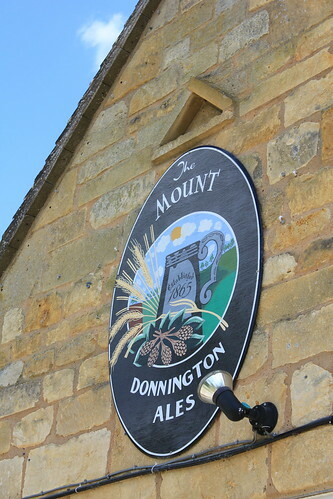 The Mount Inn overlooking the picturesque village of Stanton in Gloucestershire possesses one of the finest views of any pub in England. Taking in this charming vista over a pair of Donnington’s Ales and hearty servings of old spot sausages with cheddar mash and Hereford beef and suet pudding was a lunch to soothe the soul and calm the guts of even the most jaded traveler. 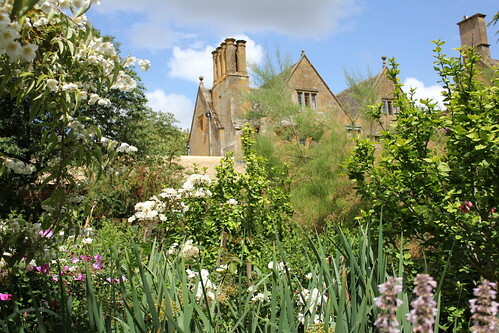 Similarly, the Ebrington Arms in the eponymous Worcestershire hamlet lying just outside the county’s perennially best-kept village of Chipping Campden and adjacent to the fabulous gardens at Hidcote Manor, was a sight for sore eyes after half a week living on water and dry toast. 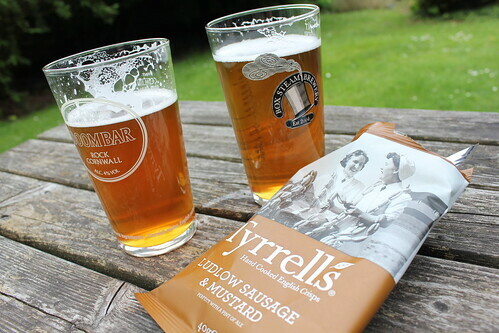 Microbrews from nearby Stow-on-the-Wold helped down a wonderfully gamey pan-fried Gloucester old spot pork chop and a Ploughman’s platter featuring local ham, farmhouse cheddar and chicken liver terrine with a selection of house-made pickles. Of course, these were just short breaks from the general pandemonium at the farmhouse where terrified chickens scattered in a harrumph of feathers at the gleeful charge of my three year old nephew and excited screams of “poo! Poo!” filled the air almost constantly. And sure, there were a good couple of days of cold and blustery rain that kept us frustratingly confined to quarters and encouraged breeching of the wine by late morning, but this was nothing to bear compared with the loss of appetite and downright fear of eating during those hellish first several days. If Beethoven’s personal purgatory was going deaf while conceiving his most brillaint compositions, then mine is almost certainly being physically unable to enjoy eating when surrounded by a veritable bounty. Sorry you weren’t 100% up to snuff during your visit. 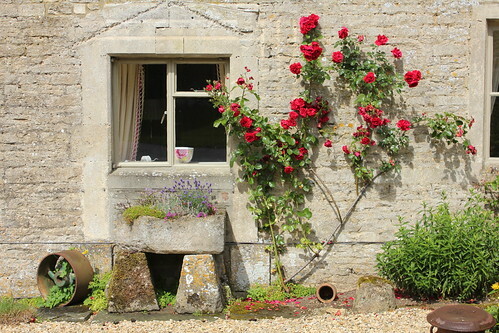 Love the photos and seeing the English countryside — plus the food looks pretty good! and pigged out every morning with glorious local pork products and eggs. Heaven. 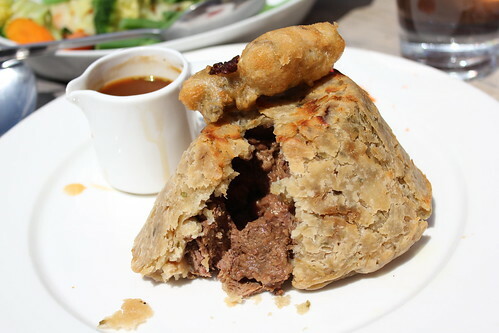 I must say that beef pie looks astonishing.. hope your appetite returned! 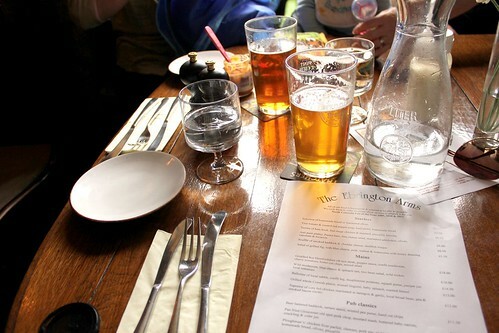 What a shame you couldn’t enjoy; the food – and beer – all look delicious, and you certainly kept things regional and local, so to speak. nice pictures! 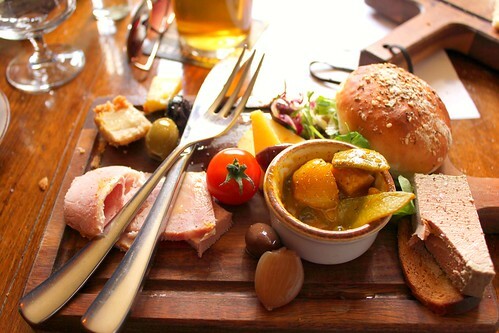 The Ploughman’s lunch is a favorite around these parts. It’s a great way to show off my homemade pickles. Glad you’re back to feeling (mostly) right as rain again. 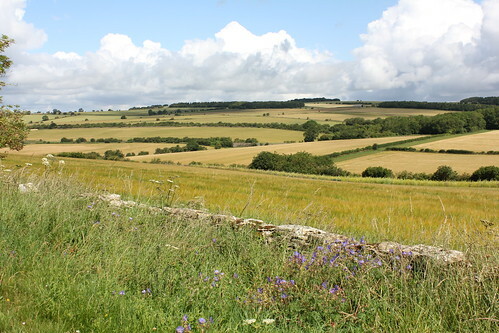 I used to have family in the Cotswolds, and we visited a few times. Later, my cousin had a lovely cottage there. Now he lives in Marin County. Coincidence? Sounds like you really put the “gastro” in gastropub. @Peter: if only I’d thought to make that the title. Excellent punning, as usual! This all looks so yummy…jealous!!! I hope to actually leave the United States again in the next decade. Beautiful post. I was transported. 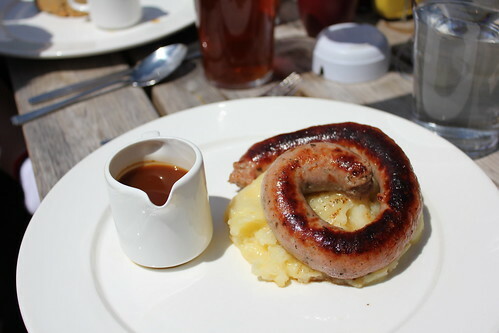 Always wanted to visit the Cotswolds and the food and drink looked like just my tastes. love the site, the words, and pics. 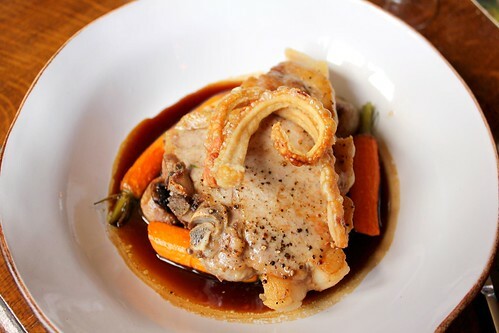 god that pub food looks DELICIOUS. oh and the Tyrrell crisps….those are quite good-not only b/c that happens to be my last name.